The wife and I attended a concept discussion and feedback session organised by GuocoLand for its Sims Drive site last weekend. Sims Driveis an old housing estate located on the fringe of Geylang, which for many of us, is a love-hate relationship - you probably love Geylang for the food but hate it (especially amongst women) for the somewhat dodgy nightlife and "extracurricular" activities. And Sims Drive, given its relative proximities to the city and with a slew of exciting developments set to take place in its surrounding area such as Kallang and Paya Lebar, may soon be transformed into a hip and modern town at the city fringe. GuocoLand acquired the 99-year leasehold housing site in April of this year. The developer paid $530.89 million or $687.88psf ppr for the nearly 2.4-hectare (263,000sqft) plot fronting Sims Drive, Aljunied and the PIE. Guocoland envisaged a 19-storey condo project with about 800 - 850 "affordable compact-sized units of mainly one, two and three-bedders". The project is expected to be launched by mid-2015. Market analysts had estimated that the breakeven cost would be around $1,090 - $1,130psf and a launch price of around $1,220 - $1,300pf. 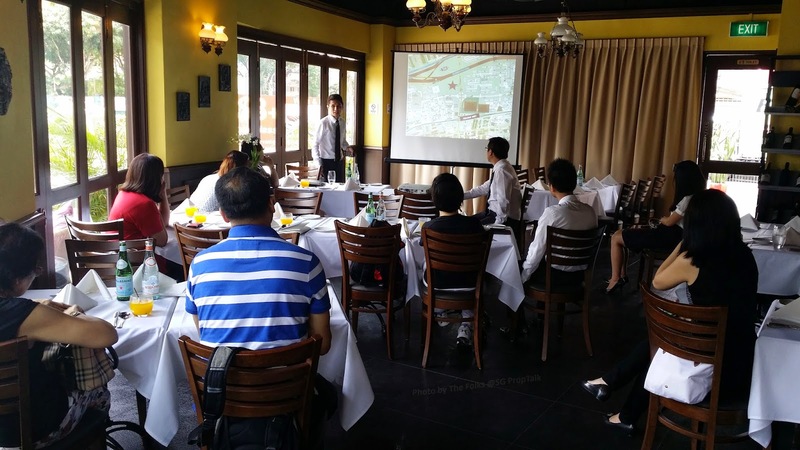 As part of their Public Communications Plan, GuocoLand have been holding sessions to discuss concept and solicit feedback for their Sims Drive project. 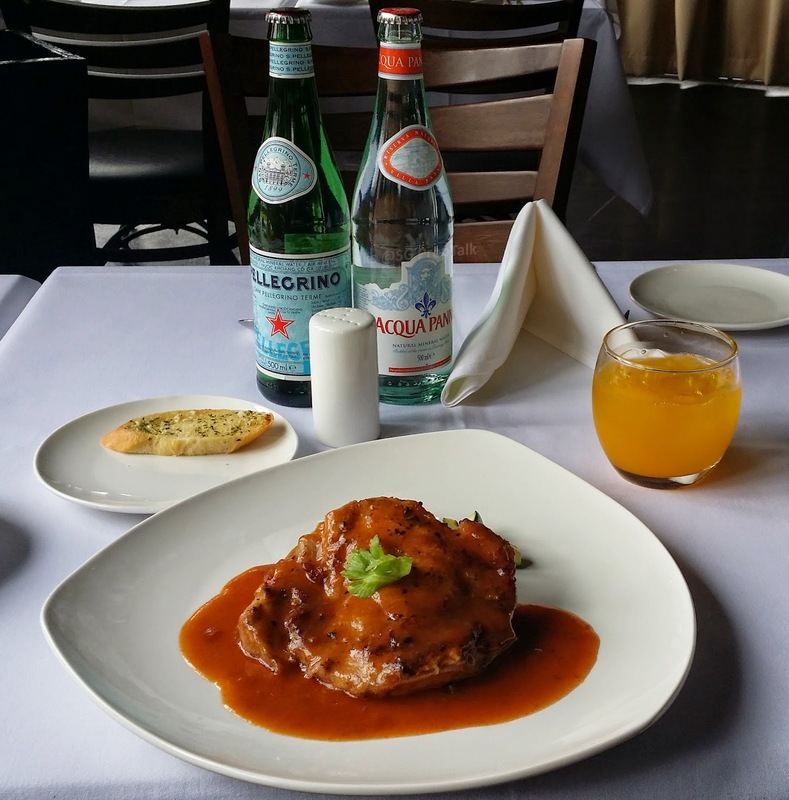 The event was held over lunch at the Fansida, a "fine dining" restaurant serving Western/European food located at the corner of Sims Avenue and Aljunied Road. · Excellent location at the fringe of the city - the CBD, Marina Financial District, Orchard Road and Kallang Sports Hub are all within a 15-minute drive away. 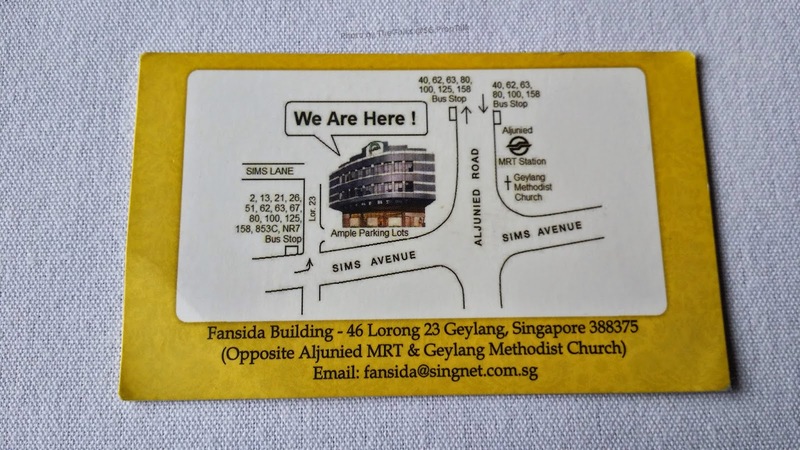 · Within 5 minutes walk to the Aljunied MRT station. · The site is mere minutes drive or 1 MRT stop away from Paya Lebar Central (Ex Singapore Post Building next to Paya Lebar MRT station), which has become another hub for banks and IT-related companies. · Choice of primary schools within 1-km of the site - Canossa Convent Primary, Macpherson Primary and Geylang Methodist Primary. · James Cook Universitywill be moving into a bigger campus at the former site of Majusri Secondary Schoolin Sims Drive. This will probably happen sometime in 2017 and should help to drive up rental and even resale demands around the vicinity. · Mid to high-end F&B outlets are beginning to mushroom around Geylang and its fringe areas like Cassia Crescentand Guillemard Road. Fansida is one such example. Other newcomers include The Tuck Shop, Maple & Market Cafe and Backstage Cafe. Such development may change the demographic and help to "raise the right profile" around the area, much like what Tiong Bahru has experienced over the past years. Over lunch, viewpoint and feedback were sought from participants on what they like to see in the upcoming project at the Sims Drive site. Opinion on how much in terms of $/psf is considered a "fair price" for this project was also sought. Below are what the wife and I have to say about the site and proposed new project, some of which we had shared during the feedback session and others we came up with after driving around the site for a bit. · One of the slides during the presentation has associated the Sims Drive project with other new projects around the city fringe like CommonwealthTowers (Queenstown) and L'VIV (Newton). We find this comparison a tad unrealistic as not all city fringe areas are perceived equal. We are already struggling to associate Sims Drive with say, Balestier, much less Newton. · Although Geylang and its fringe areas are moving towards the right sort of transformation, we will not be quite as hasty to say that it will soon become the "Tiong Bahru of the East". In terms of size and spread, Tiong Bahru is definitely a much smaller area to transform. It also did not come with as big a "perception baggage" that required unloading. · Although the participants were told that GuocoLand are still working on the project detail and pricing, the $1,400psf number was floated supposedly for discussion purposes. And you do not typically suggest a number without prior consideration and more importantly approval from management. With The Panorama (Ang Mo Kio) currently selling at an average price of around $1,200psf and Thomson Three(Upper Thomson) at a tad below $1,300psf, we do feel that $1,400psf is probably way too ambitious. This is especially when every father, mother, son and even their pets are saying that the property market outlook is going to be worse come next year. 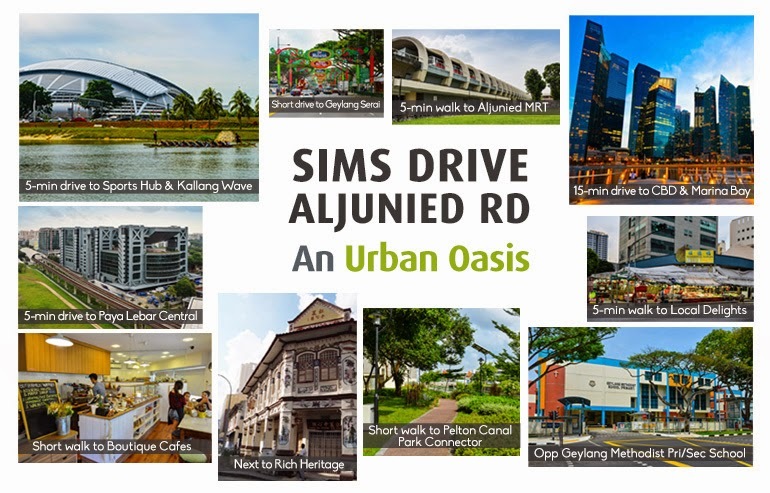 · The Sims Drive-Aljunied area currently consist of primarily HDB dwellers. As such, the catchment in terms of potential buyers are more likely to be upgraders. Although there may be some demand for one-bedroom units from singles and investors seeking rental income (in view of the new James Cook university campus situated round the corner), we reckon the bulk of the interests will probably be for the bigger 2- to 3-bedroom units. So GuocoLand may want to put more of these into the project instead of maximizing on the one-bedders. · The wife and I decided to take a drive around the actual site and we were not too impressed by the location. 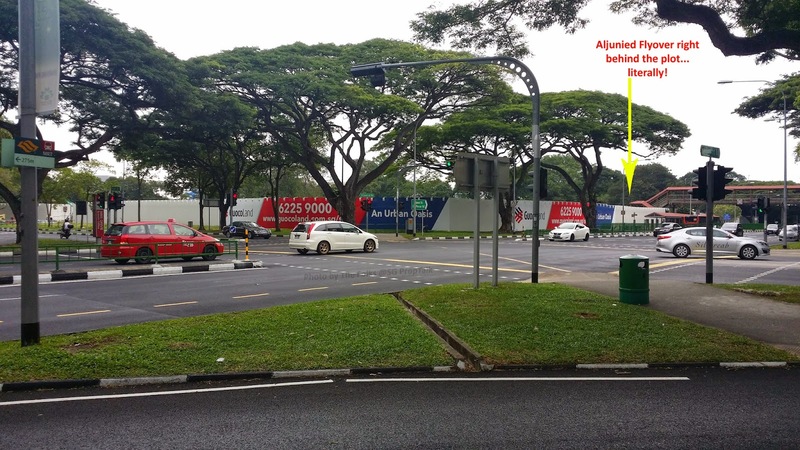 The site is really right smacked at the junction of the Aljunied Road and Sims Drive, with the PIE (make that the Aljunied Flyover) running along the back of the plot. And if the Anak Bukit Flyover at Upper Bukit Timah is any indication, the decibel levels coming from vehicular traffic on the flyover can be quite deafening especially for units on the higher floors. So GuocoLand will probably have to design the project to minimize such noise impact, e.g. building the apartment block as far away from the flyover as they possibly can and providing lots of tall trees at the back of the plot to "absorb sound". · We also reckoned that the view for the higher-floor units may not be too pretty. The surrounding area consists mainly of older HDB flats and flatted factories. Although there are talks about the Government wanting to redevelop and revitalise the Sims Drive area, nothing concrete is in the pipeline as yet. So GuocoLand will probably have to double their efforts to beautify the interior grounds of the project to compensate for the "not-so-exciting" external view. Our humble opinions aside, the wife and I felt that such concept discussion and feedback sessions, while more of a PR stint, is actually a pretty good idea. At least it demonstrates to some extent that the developer is keen to obtain (and consider) the viewpoints and suggestions of potential buyers. Hopefully more developers will adopt the same approach for their upcoming new launches. And just for our own feedback purpose (not on behalf of the developer), what do you think about the Sims Drive area and how much in terms of $/psf will you deem the project as "fairly priced"? 5 comments to ''GuocoLand @Sims Drive: Concept discussion and Feedback session"
It should be around $900 to $1000psf as the site is nearby industrial sites, lots of old HDB and most of the residents living in sims drive are elderly. You need to have a car to drive to cbd as there is no public buses going to and fro. There's not much amenities like supermarkets and mall to Aljunied area. And since it is nearby Geylang, the surroundings is similar to race course that are mostly populated by indians and chinese nationals. It will depend on the price that Guocoland launches the project at. Comparing to sleepier areas like Queenstown which is 5 mrt stops away from city centre. Commonwealth towers beside queenstown mrt was launched mid 2014 and sold between 1433psf to 1940psf. While Aljunied mrt is only 4 stops away. And considering that Sims Drive is strategically located in close proximity to growth clusters outlined by Singapore’s Government in the 2014 Master Plan such as the upcoming Paya Lebar sub-regional centre – a thriving commercial and business hub; Kallang Riverside - a waterfront lifestyle and leisure destination. Not forgetting the mature status of the district as a residential hub at city fringe too. Expected strong demand due to its proximity to Aljunied MRT which is only a 5 mins walk away, and a 12-15mins train ride to city centre, coupled with the developments in Paya Lebar will make Sims Urban Oasis an attractive proposition for seasoned investors and homestayers. More information on launch timeline and pricing of Sims Urban Oasis here. The wife and I can appreciate the intention of this comment especially given the vested interest. As the Chinese says: "卖花赞花香" (literally translated as "those who sells flower will say that their flowers are fragrant"). But to compare a project in District 3 (Queenstown) versus one in District 14 (Sims Drive)... seriously? The former certainly does not have them bright lights and "exciting" nightlife you find in Geylang but we will hardly consider Queenstown as "sleepier" given its relative proximity to Alexandra Village, Holland Village, Redhill and Tiong Bahru. And while talking about mrt stops, the wife and I must admit that we do not take the MRT very much but we reckon "one MRT stop difference" is not really that big a deal - granted you probably save like 3 minutes every trip but is that necessarily a deal breaker? We don't think so. But having said that, the notion of "city centre" (along the East-West Line) can also be rather subjective - is this City Hall, Raffles Place or Tanjong Pagar? If we are asked to choose between Queenstown and Sim Drive now (to be fair, we wouldn't know what's gonna happen in 10 years' time, for example), the wife and I will take the former over the later anytime. And if we are asked to compare Commonwealth Tower versus Sims Urban Oasis specifically, we will prefer to live next to an MRT track with the MRT station right at our doorsteps rather than the PIE with the Aljunied Flyover right next to our condo anytime.